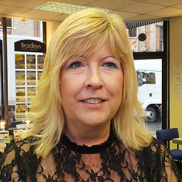 I work as a part time sales negotiator at Bradleys busy North Street offices. I have been working in the industry for almost 30 years, all of which have been based in Exeter. I live locally with my husband and have 2 older children and more recently my first grandchild. We also have a Jack Russell dog (Murphy) who is a great companion and keeps me fit. Like many of my colleagues I have a very good local knowledge having lived and worked in the City my whole life. Exeter is a wonderful City to live and work and I feel I am well placed to pass that enthusiasm for the area onto clients. I am an office based negotiator and am proud to work in an environment where the focus is very much on customer service.